Just few days are left in the start of Islamic festival of Eid Al Adha. The primary function of this festival is sacrifice of animals for sake of Allah’s blessing. Like other countries, UAE also provides special facilities to citizens and residents of the country on this happy occasion. This Eid festival will start from 20th of August 2018 and the government has already announced holidays for both public and private sectors. According to details, employees of public sector will enjoy this Eid from August 19 to 25 while there will be 3 holidays (August 20 to 22) for private sector. As this is a happy occasion for Muslims in UAE and all over the world, so the government is trying to give maximum facilities to people in UAE. 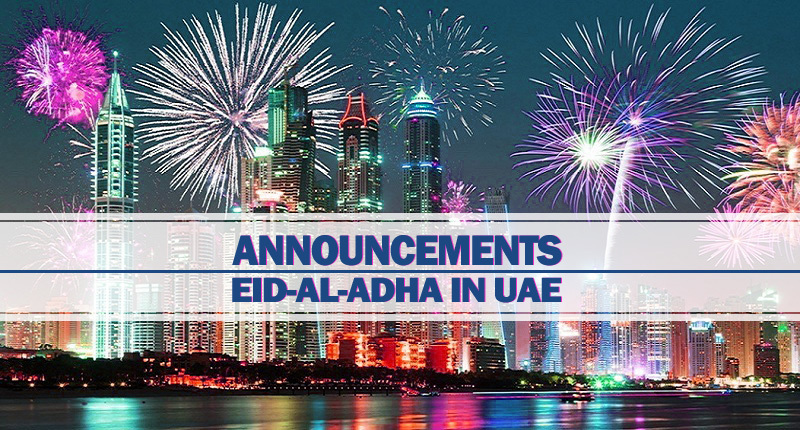 Various entertainment activities will be held in different parts of UAE during this happy festival including huge fireworks, Ferrari World Abu Dhabi and several others. These activities will allow the residents to enjoy Eid holidays with their families. An important step taken by the emirate of Dubai is allowing free parking during all week for Eid Al Adha. In a recent such move to provide special facility to the citizens and residents of Sharjah, the ruler of Sharjah has announced scholarships for University of Sharjah (UoS) during this upcoming occasion of Eid. According to this latest order, total 833 scholarships will be awarded to the lucky recipients. Sharjah Electricity & Water Authority (SEWA) is the department that will offer these scholarships. According to details, these scholarships can be availed by retired SEWA pensioners, children of deceased SEWA pensioners and children of UAE citizens who earn less than AED 50,000. All these important steps taken by various emirates of UAE clearly reveal that rulers of the country are always ready to provide best facilities to their citizens and residents. UAE, especially Dubai, is preferred by foreigners from different parts of the world for the security and modern services they receive here. Now, it is lot easier for investors and professionals to stay in UAE for longer period. These steps will attract more foreigners. These orders for benefit of citizens and residents are not confined to Eid and other such festivals but these opportunities are available year round.